So, fellow backloggers, what has become of your gaming for the past month? July is over and we are through the middle of the summer. August is now here and we prepare for the oncoming onslaught of multiple console launches and more Nintendo games than you can shake a stick at (don't shake a stick at them, just accept them into your heart). I'll go first (obviously). Project X-Zone - What a long game. So padded out. It's pretty fun and it's cool to see all the different matchups and meetups and it has KOSMOS so I will instantly enjoy every part after that (and they even included nods to her appearances in the other SRW games such as when she gets damaged and starts saying nya). But man, the padding. Just the sheer number of enemies in some of those battles gets really tiring. As a console game, I don't think it'd fly. As a portable game where I can close the lid and pick up later? Worked mighty fine. 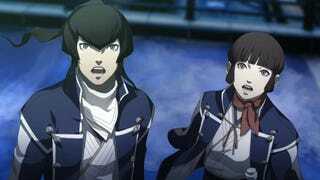 Shin Megami Tensei 4 - Excellent excellent title. While you definitely have to play it enough to get all three endings (you can make a save at a certain point and head down the other path easily enough but Neutral takes a bit more work), it is worth the replaying. It's kind of annoying to have everyone go OMG NOT PERSONA or continuously ask about Persona in relation to it though. Yeah yeah I get that that's more popular in the US now but it's still irksome to see people not let it stand on its own. The complaints about not having enough story or weak story or whatever really don't ring true and kind of miss the point of the SMT series, which is quite a bit more subtle and is more about the player's desires. They also made demon fusing by far the best out of every Atlus game. It's so slick and neat to go through. Muramasa Rebirth - it was my second time playing through the game and it was still pretty fun. One of my friends never gave it a chance on Wii and now he kind of regrets it because he went and platinumed the game. I just gave it the playthrough of each side and I'll probably go back later for some more since I already did everything on the Wii version. Lots of fun though. And as usual, whatever "complaints" exist about backtracking don't apply to me. It's just part of the genre. Time & Eternity - okay, I completed this a couple days ago so maybe it doesn't count for July but it's....pretty painful. I will put up the synopsis I made of the plot somewhere if anyone wants to read it but it is just...unbelievably dumb. The game is bland, the characters are bland, the animation's janky, the story is flat-out stupid stupid stupid. Anyone that's ever complained about FF13 being a bad game just has no clue. This is what a bad game is. I almost want to say it should be required playing for RPG people because it just shows what not to do at basically every turn. Some of the music is okay but it's still Yuzo Koshiro's worst OST. So I got through a technical 4 games with 3 of them being S/RPGs (T&E is very short for an RPG at 20 hours for all sidequests+story). How'd you do? I'm also going to begin tearing through my Steam backlog soon. And I'm going to stream the whole thing likely every Sunday and Tuesday-Thursday, schedule permitting. Possibly on some Saturdays too. It's not all all of my Steam games but I cut down what I had to what I actually want to play, games that aren't unbelievably long and games which actually have endings (so stuff like Civ5 is obviously out, most puzzle games too). It's a list of about 60 games and I'm probably going to begin going through everything as soon as I'm finished with both Pikmin 3 and Tales of Xillia...and probably Mario & Luigi 4. I'm also also going to be taking part in the Extra Life gaming marathon this year in November, which is now slightly longer at 25 hours. I'm not entirely sure what I'll play for it but I'll come up with something fun and there'll be something for that too.